With so many pre-owned vehicles on the market today, it makes sense to do your homework so that you choose the very best investment of your automotive dollar. For maximum value and security, the Chevrolet Certified Pre-Owned program offers the best bang for your buck. The friendly associates at Phillips Auto Group of Bradley welcome the opportunity to answer all of your questions about this innovative program. Before you even drive off of the lot, your Chevrolet certified pre-owned vehicle will already have $2,600 of value built right in. This value comes from the two guaranteed maintenance visits combined with the exceptional warranty program. 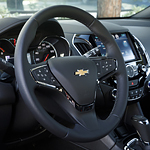 A Chevrolet certified vehicle meets a variety of requirements, all designed to give you peace of mind with your purchasing decision. Each vehicle must be within current six model years, be within a maximum of 75,000 total vehicle miles, possess a clean title, and pass a comprehensive vehicle history report.